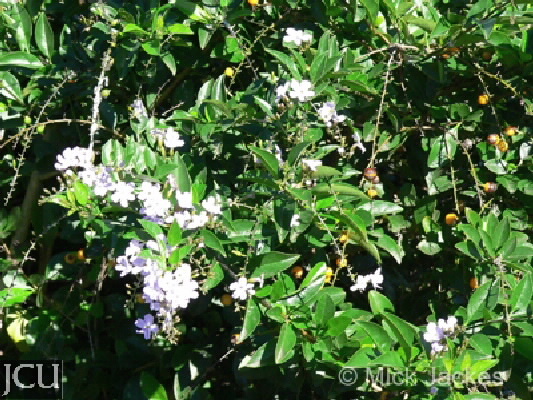 Formerly known as D. repens, this shrub or small tree has become a serious weed in the wet tropics where it can form an impenetrable hedge or thicket. Originally from South America the branches are frequently somewhat spiny and usually drooping. The leaves are opposite each other or in whorls of 3. 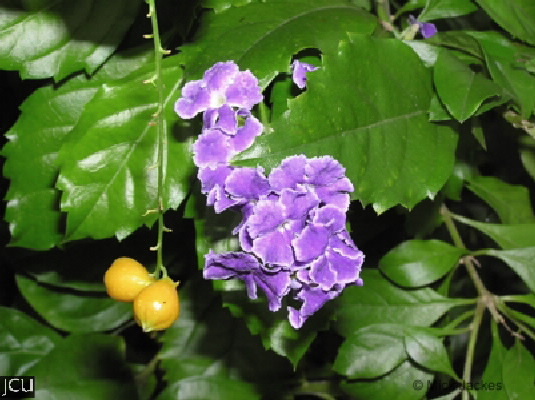 The tubular flowers are usually blue, purple or white and may be in long sprays or clusters. The flowers are followed by the yellow to yellow-orange, fleshy fruits and the seeds are eaten and dispersed by birds. These attractive seeds are toxic. There are numerous cultivars, some with variegated foliage, as well as different colour forms. The cultivar “Geisha Girl” is apparently not as invasive as some of the other cultivars.